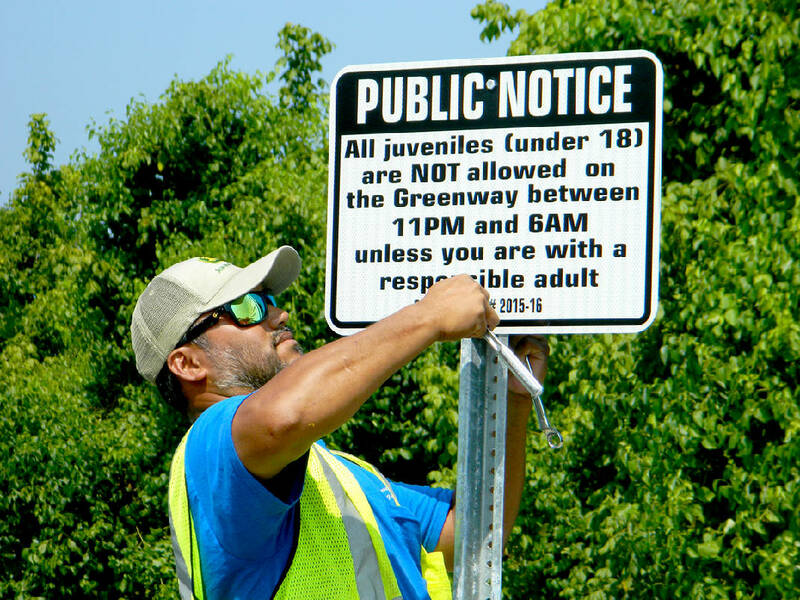 Please Haruo, a signs and markings technician with Cleveland's Public Works Department, posts a new ordinance that prohibits juveniles under the age of 18 years of age to be on the city's greenway between 11 p.m. and 6 a.m. unless they are accompanied by a responsible adult. CLEVELAND, Tenn. -- Signs are up on Cleveland's greenway warning juveniles they're under curfew on the city-owned property. City crews put up the signs Tuesday at greenway parking lot entrances between Willow Street and Mohawk Drive. The signs serve as visible reminders of an ordinance passed July 13 by the Cleveland City Council that says people under age 18 may not be on the greenway between 11 p.m. and 6 a.m. unless accompanied by a responsible adult. The ordinance was requested by the Cleveland Police Department, which has been combating greenway vandalism in recent months. On Monday, Capt. Mark Gibson, the police department's interim chief, told the City Council that enforcing the new curfew has gone smoothly, even without the signs. "We haven't had any problems enforcing it," Gibson said. "People who have questions about it seem to be accepting it pretty well." The council also is considering whether to buy a security camera system to try to catch vandals. "We've had continual vandalism on the greenway," said Assistant City Manager Melinda Carroll, citing repeated City Council and greenway board discussions. Carroll gave council members a briefing on a 10-camera, portable system that costs $62,345. The devices, manufactured by Q-Star, are solar-powered and can transmit data to smartphones and other hand-held technology in real time. "I was expecting more cameras for $62,000 than 10," Councilman Dale Hughes said. Councilman David May questioned the cameras' durability, citing concerns that an expensive camera might be destroyed by a pellet gun. The devices impressed city staff with their ruggedness and they have good references, including Chattanooga, Carroll said. Carroll said she would bring more security camera alternatives for the council to consider at its Aug. 10 meeting. In a July 21 memo to the council, Carroll said city staff already had reviewed several surveillance systems and agreed that "this system is the technology that will help the city and offer a safe environment for the citizens as they enjoy walking, running or biking on the greenway." Gibson said a security camera system is a useful tool, but expressed some doubt about its potential to deter vandalism. "[A security camera] doesn't necessarily deter people from doing the acts; it's just a tool to help us identify the people who are doing the vandalism and criminal acts," Gibson said.